We dont really have that many vehicles to use in the SPL world....theres the panda/bella....and the crx. Then the guys in south america have a couple other cars they use but im not too familiar with those...good for them for thinking out side the box. We use the explorer at times...which has some major advantages over the crx in certain applications...but in others its just not even close. When it comes to a walled vehicle....history will show that it matters much less what type of vehicle you have because of course only the B pillar forward is exposed. But even in a walled setup there are certain parameters which work far better than others. -A flat vertical B pillar for instance is a large advantage. -The more vertical the windshield is the better. Or atleast if its in the same angle as the B pillar to align the baffle with the windshield. -A huge advantage (panda/marbella/terra/trooper/rodeo/very few others) is a FLAT GLASS WINDSHIELD. When you think about it....the closer to flat the windshield is on these vehicles....the louder they can be. If im not mistaken the panda/bella/terra windshield is actually flat glass with no curve or compound curves at all. (atleast it appears that way, I could be wrong.) but even if it isnt, its obviously very close to being straight...which in my opinion offers a large advantage. Now, what if you want to compete in SPL but dont want to be a cookie cutter and run the same vehicles that everyone else has. There were years in the early 2000s at world finals where literally 90% of the competitor vehicles were either a crx/panda/astro van/caravan/extreme vehicle. When I decided to really compete and try to win, I decided to go a bit different from them norm and use a 2nd gen explorer which was great but even than had been done a few times before. Including a couple guys who were louder than ALL the crxs in the world at the time with their explorers btw lol. Anyway, for anyone interested in a "new" SPL vehicle to the mix that will very likely do extremely well in all classes. Just like a panda. Will dominate in street classes....or put a wall in it and you still have that winning combination of flat glass, the unique dash shape, and an oddly stirdy and overbuilt little car. Well, I do believe that this vehicle has these exact same attributes while also having probably quadruple the cargo area. Toyota Land Cruiser Fj40...made from 1960-1984. There should be quite a few of them around...some are very expensive but you can get cheaper ones for very cheap also. Their advantage though is in the cargo area....not only all that cargo volume but the window line appears to be high enough that 18" woofers could be fired forward. I havent yet measured one but this is my thought. Heres a few pics.... 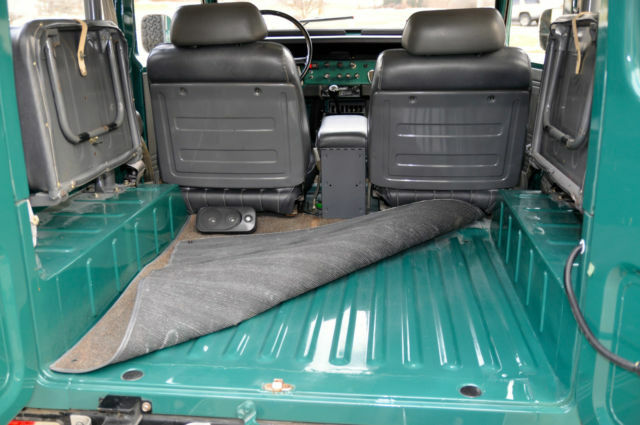 The rear seats of course would remain intact and full functional but just get folded up..which allows for the entire cargo area to be used for gear. Of course the gear cannot interfere with the seats folding down but this is only a couple inches inward on each side...no problem really. As seen in this pic. Now not only is the cargo area very special but as I mentioned...that windshield is flat glass....AND the dashboard is extremely minimalistic which wont deflect or absorb any waves like most dashes nowadays will which have countoured compounded sides and edges for comfort. Clearly this fj40 was built for function not for comfort at all. For anyone looking to get into spl and really wants to put some money into it and a lot of time. Devote a few years ( it will still take a couple years lets be honest. IF, it ever happens.. The best of the best guys out there have a 20 year head start on you using crx's.) and Id suggest not working on it yourself...but get a team or 4 or 5 guys to devote all your money and resources to the project. I really think these FJ40's are a super special vehicle for SPL....they have a TON of potential. Their only downfall could possibly be if they were really flimsey in their build quality...as ive never really inspected one physically. But they come from an era where things were built right, and they appear to be a very sport utility inspired design which should really be durable so id imagine theyre pretty badass. I really hope someone takes my advice. They would work great with a wall too as many people have proven over the years with the isuzu trooper which is very similar shape and design with the flat windshield...but also had the 4 wd capability which can be disabled to power itself front wheel drive only and utilize a full floor cut for the enclosure. I believe the europeans were the first to do this in their extreme rides and my buddies Team Riprock adapted it soon after in their beautiful work of art that is their 181+ db trooper. For those interested in doing a walled setup these fj40s are almost all 4wd so the same sort of floor cut could be achieved. Aswell as a no-wall setup. I think the window line is high enough that even without a floor cut, in a no-wall class one could come very close to stacking 12s and partially stacking 15s to get a ton of cone area on that forward baffle which has proven to be the way to go in no-wall. once again, i really hope someone takes advantage of all these free info that ive accrued over the years. in my day guys didnt give this type of stuff up for free.....i know that for a fact because i was hunting through all the forums and went through every single post of my competitors usernames just to try to get some sort of slip up on what they built to get loud in their setup. Ive got a Clean Bill of Health!! 6.5 door speakers and 6x9 deck speakers?? ?